With the Singapore Lions football team winning only one game in about a year, Straits Times sports correspondent Wang Meng Meng tackles the problems plaguing the national squad. The Singapore national football team are winless for more than a year after yesterday evening's 0-3 defeat by Bahrain in an Asian Cup Goup E qualifier at the National Stadium. 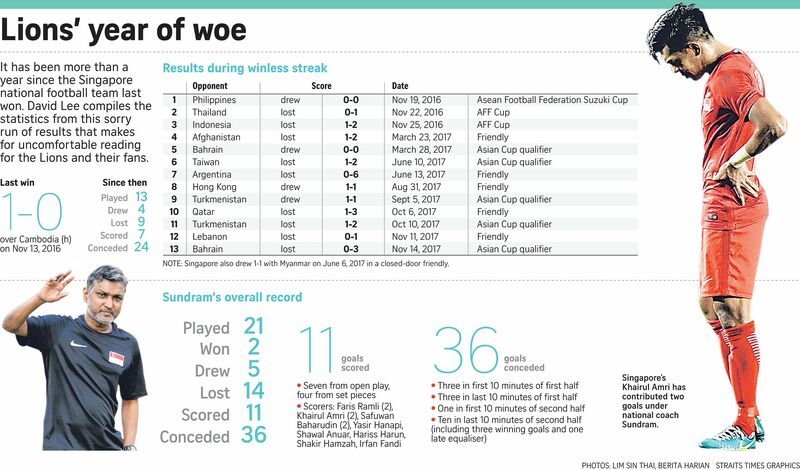 V Sundram Moorthy's men have now gone 13 'A' matches without tasting victory and the results are a cause of concern for a side that were crowned Asean champions in 2012. Although recent performances have indicated some improvement, the Lions still lack bite and the killer instinct. So what has gone wrong and what can the Football Association of Singapore (FAS) and Sundram do to make the Lions a regional force again? Former national defender Kadir Yahaya, now the coach of the St Joseph's Institution football team, believes the Lions need to police themselves, take ownership of the poor results and perhaps even dish out the hairdryer treatment to wake the under-performing players up from their slumber. The 49-year-old, who was part of the 1994 Malaysia Cup-winning team, told The Straits Times: "In the past, when the national team lost one game, Fandi (Ahmad, who was the captain then) would storm into the dressing room and show his anger. If the team don't win for such a long period, it's a disease. To cure it, everyone from FAS to the coaching staff should give encouragement to the players. MIKE WONG, former Singapore assistant coach to Raddy Avramovic. There must be a system of rewards for the players if they reach a certain number of caps. For example, if a player has 50 caps, maybe the FAS can rule that he deserves a certain minimum salary. KADIR YAHAYA, former national defender. "He would throw water bottles and kick the cupboard. Malek Awab would knock the young players on their heads. That's what losing felt and sounded like. Can you imagine Fandi's anger if Singapore went one whole year without winning? "The display of rage had a big effect on the Lions. The players would give 100 per cent during training the next day. "We all feared and respected Fandi and the seniors like Malek. We no longer have players like this. There is no voice in the dressing room." A former national player, who declined to be named, traces the problem down to the developmental level, warning that ill-disciplined Cubs can fail as Lions in the future. He said: "It all boils down to fundamentals - there is not enough discipline instilled at the youth level." Case in point - the Asian Football Confederation Under-18 Championship qualifier collapse to Mongolia last Wednesday. The Cubs led the hosts 2-0 before frayed tempers saw two of Christophe Chaintreuil's players sent off and Mongolia recovering to win 4-2. A third player was red-carded after the match. "The FAS and the coaches must enforce discipline and let the boys know that they cannot step beyond some boundaries," the former Lion added. "When I played for Singapore, senior players walked the talk. They gave the juniors scoldings if they stepped out of line. They reinforced the message that if you misbehave, you are tarnishing the country and the team. "Sadly, after (ex-Lions coach) Raddy Avramovic left (in 2012), the discipline from the youth to senior levels is not that good." He wears the armband and inherited Fandi's iconic No. 17 jersey. He was named Asean Football Federation's (AFF) Most Valuable Player in 2013 and scored 14 times in 134 international appearances. Only Khairul Amri, with 32 goals, has scored more for Singapore in the current squad. Although now 33, Shahril Ishak is still an expert at timing his runs into the box to grab goals. His 11 S-League strikes for Warriors FC makes him the joint local leading scorer this season alongside Home United's Faris Ramli. Yet, he continues to be used sparingly as a late substitute by the national team. Sundram is struggling to find a reliable source of goals - Singapore had scored just 11 in his 21 games in charge. He tried to use Safuwan Baharudin, who excels in central defence, as a striker, hoping the 26-year-old's aerial power can profit from direct balls but it hasn't worked out. Warriors coach Razif Onn believes Shahril can still do a job for Singapore, saying: "For my team, Shahril has been fantastic from day one with his intelligent combinations with Jordan Webb and now Andrei Ciolacu." Hougang United coach Philippe Aw added: "Safuwan is a natural choice at the back because he is a rare breed of defender who is strong in the air, quick on the ground and comfortable on the ball. "If he plays in defence, this will free up Hariss to boss the midfield." Another of Sundram's left-field selections is Hariss Harun, one of the team's best midfielders, who is used as a centre-back. Ex-Lions coach P.N. Sivaji, who is currently the technical director of Myanmar National League club Hantharwaddy United, believes the 26-year-old must be played in his best role. He said: "Hariss is someone who can break opponents' attacks with his positional play and strong tackles. "With the 3-4-3 Sundram has employed, maybe what the team need in midfield now is a Hariss who works tirelessly to intercept, tackle and win the aerial balls. We looked porous in midfield against Lebanon (0-1 loss) when we didn't have the ball." FOCUS ON RESULTS OR BUILD FOR THE FUTURE? Age is catching up with many of the Lions with the spine of the team approaching the end of their careers. Goalkeeper Hassan Sunny (33), defender Daniel Bennett (39), midfielder Fahrudin Mustafic (36) and forward Amri (32) are in the current squad. Other veterans previously picked were Shahril (33) and Fazrul Nawaz (32). Although Hassan and Bennett remain two of Sundram's top performers, they can't play on forever. "The FAS must be bold enough to decide if it really wants to build the future national team," said the former national player. "Sundram's job is about getting results with the best players. But will the FAS tell him to focus on rebuilding? The direction has to be clear. "Our football is seriously in a shambles now and we cannot waste any more time drifting around. "When Germany lost the World Cup final in 2002, they decided to focus on youth. They boosted their scouting to look for players aged 12-18. "That helped them to groom a new crop of players to win the 2014 World Cup." Kadir believes some of the current Lions are not motivated enough to don national colours. To keep them hungry to wear the red shirt, he believes in dangling some carrots. Kadir said: "We must recognise our football heroes, it is so difficult to earn 100 caps as you need to stay very fit over a long period. "Players with 100 caps should be granted testimonials and be honoured at the National Stadium. "Sundram has only a small group of players to pick from. There must be a system of rewards for the players if they reach a certain number of caps. For example, if a player has 50 caps, maybe the FAS can rule that he deserves a certain minimum salary. "This will encourage players to think that playing for Singapore is a really big thing. Young players will want to emulate the seniors, too." Mike Wong, a former Singapore assistant coach to Avramovic when the Lions won the 2012 AFF Suzuki Cup, believes the team are short on confidence and perhaps more can be done to encourage the players to get back on their feet again. Wong, who is now the technical director of Laos, said: "If the team don't win for such a long period, it's a disease. To cure it, everyone from FAS to the coaching staff should give encouragement to the players. "When the team work on their finishing during training, do not put too much pressure on them to score. Give them positive feedback that they are running into goalscoring positions. That will gradually get their confidence back. "During the years 2010 to 2011, the national team were in a bad shape. The media was hitting Raddy badly and called for his head. But we worked on the mental aspect of the players. "We told the players that we are not going to the AFF Cup to make up the numbers. We will use our strengths and just focus on doing our jobs. "There were no extra training sessions. We left each session happily. In the end, we won the tournament against the odds. Sometimes, it's the simple things that will work." Sivaji suggested specialised training to polish the players' skills. He said: "There should be a lot of work done with the existing strikers at all age groups. "Individual training by positions should be the mantra. Maybe there has been too much emphasis on team training and the requirements of the individual positions have been overlooked."